Looking at pictures of papers on the web is only just better than reading about them. Nothing beats having the papers in your hand to compare and decide what is the best paper for your next image. 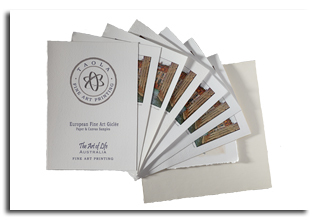 Order your Fine Art Paper samples under "Paper Type". You will recieve the following in a A5 bound booklet.